Missoula County courthouse Lobby. Hogarth Petworth Picture Lights illuminate the vivid, newly hung E.S.Paxson Paintings. Hogarth were chosen to illuminate these very fine E.S. 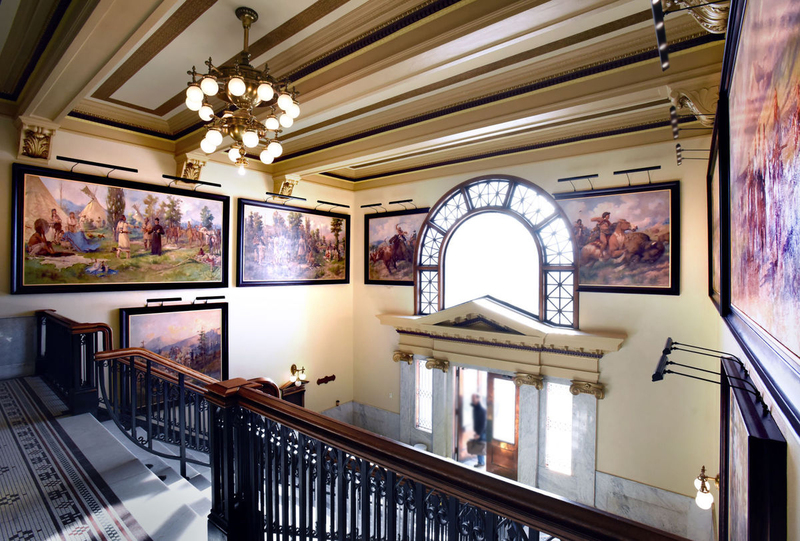 Paxson paintings, hung in the lobby of the Missoula County Courthouse. After four years gone missing from the entryway walls of the Missoula County Courthouse, the eight paintings that the nationally known artist was commissioned to produce in 1912 are back and in even fuller glory. This time, dark custom frames and tasteful overhead lighting enhance historic western Montana scenes of, among others, Meriwether Lewis and men crossing the Clark Fork River in 1806, the signing of the Hellgate Treaty at Council Grove in 1855, and Chief Charlo’s Bitterroot Salish leaving their homeland in 1891. E.S Paxson, was born April, 25th 1852. He was an accomplished artist. Not only apainter but also a scout, soldier and writer. Based mainly in Montana. He is well known for portraits of the Old west and Native North Americans. Paxson was born in East Hamburg, New York, near Buffalo, on April 25, 1852. His father, William Hamilton Paxson, had a carriage-building business. After attending the Friends’ Institute school, Edgar entered his father’s business, painting carriages and signs. His experience as a sign painter probably introduced him to skills he would later develop as an artist, but there is no evidence that Edgar Paxson received formal art training at this time. In 1874 he married Laura Johnson, and the following year he set out for the West. Paxson worked for a stagecoach company, as a guide, and at other frontier jobs that provided experiences he would later use in his art. In 1878 he brought his family to Deer Lodge, Montana, where he painted signs and scenery for theatrical backdrops. In 1881 they moved to Butte, where Paxson continued painting scenery, but also established a studio and produced easel paintings of historical subjects and portraits of Indians. The artist also maintained his love of the outdoors, going on hunting and camping trips. Under the name “Pistol Grip,” he wrote articles about trapshooting and subjects of interest to the hunter for The American Field, a sportsman’s journal. He also enlisted in the Montana National Guard, where he developed friendships with military leaders of the region.